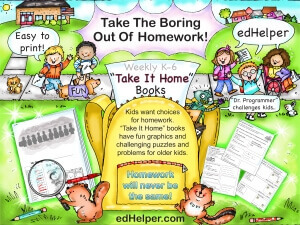 Take the boring out of homework with these engaging workbooks for students to complete. These books combine math with reading, writing, critical thinking skills, and puzzles to make them fun for kids. It's the H word. Parents cringe when their kids mention it. Teachers mutter it under their breath in the lounge. It's dreaded, but it's a necessary evil. Or is it? Homework, has been around since the era of slates and continues to this day of standardized testing. It's been the one constant in education amongst the transition from one size fits all textbooks to differentiated instruction and integrated technology. Recent trends, however, have people debating the benefit of after school assignments and its impact on academic achievement. Amongst conflicting beliefs and theories, one thing seems to be clear: too much homework or too much of the wrong type of homework is like the other H word. We recognize the challenges teachers face daily to provide meaningful, engaging, and fun learning opportunities for their students and that is why these homework workbooks are engaging, fun, and help kids learn. Research is finding a positive correlation between homework and academic achievement, especially for older students. When intentionally assigned, with a purpose other than keeping students busier after school than they already are, homework can help develop study skills, perseverance, review key points from daily material and lay the groundwork for upcoming lessons. 1) Give your students the gift of time. The long-accepted rule of homework length has been 10 minutes per grade per night. Third grade students, therefore, should have no more than thirty minutes of homework each evening. Does this seem reasonable for your students? Are they capable of completing 30 minutes of a meaningful activity in addition to some pleasurable reading each night? If not, consider adjusting the expectation. Set a reasonable time limit. Encourage your students to complete as much of a given assignment as they can during that time and then end the homework session for that evening even if they are not finished. This freedom may relieve homework (and parental) anxiety. Rather than worry that they are going to be stuck all evening working on a problem that they just can't solve, your students can give their very best effort for a set time and then move on with their night. 2) Give your students the gift of flexibility. There is power in being able to choose what we want to do and when we want to do it. When considering a homework policy, why not consider weekly rather than daily homework? The freedom and flexibility in weekly assignments benefit students in many ways. It gives them the opportunity and responsibility to choose when they want to complete their given tasks. It allows them the chance to enjoy family outings, sports practices, or simply a lazy night at home watching TV rather than being forced to complete specific assignments every afternoon. This is also a great growth tool in teaching personal responsibility. Some people, adults included, work better under pressure. If a child chooses to leave all his homework undone until the day before the due date, it is his or her prerogative. It may be a productive system for their learning preference. Other students prefer to spread the tasks out more evenly because that system works better for them. This type of flexibility allows for more quality family time and balance. 3) Give your students the gift of choice. If we are truthful in our evaluation of homework assignments, we would recognize that just as our lessons and experiences inside the classroom need to be varied to meet different learning styles and preferences, our homework assignments should be differentiated as well. When looking at your goal for an assignment, is it possible that more than one path could lead to the same destination? Why not offer your students multiple options and allow them to choose the assignment that is most meaningful and engaging for them? If you are choosing to give just one assignment, why not allow your students the chance to choose which part they'd like to complete? Give them the power to choose what section they feel they need to review or which side of the paper they want to tackle. Giving your students the power to choose their parts of the evening's assignment will help teach personal responsibility. Students who choose to do more can take pride in knowing they gave their best effort. Students who choose to do little must evaluate whether that amount of work was enough for them. If our goal is to raise successful students, we must provide them the opportunities to take responsibility for their learning. 4) Give your students the gift of value. If you know that you won't have the time or energy to grade a certain homework assignment, is it worth your students putting the time and energy into doing it? Your students are more likely to be engaged in their learning when they know that you see the value in what they are doing. Lower level thinking, rote comprehension, or drill and kill math fact sheets may have a time and place, but that place is most likely not at the kitchen table as a homework assignment. Why not assign your students a conversation? Encourage them to have a discussion with their family about the latest topic in science. Ask them to watch the news with a parent and talk about world matters as part of your social studies curriculum. Provide a link to an educational video that you watch in class and ask them to share it with a younger sibling. These and other meaningful activities force us outside of our traditional homework box and provide our students with the framework to do something educational at home with those they love. Remember, homework doesn't have to be the H word. It can be engaging, meaningful, and even fun! It can extend and support our classroom learning experiences and strengthen the home-school connection. It can play a critical role in developing study skills and perseverance. Let edHelper.com's limitless resources help you create exciting and purposeful after school activities for your students. Our mission is to help you help them!